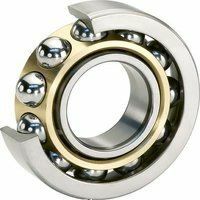 In this section you will find a range of Nachi precision bearings and can choose between matched pairs and single bearings. Nachi are world renowned for producing high-tech, low maintenance components which can really be relied upon. The precision bearings found here are suitable for use in industrial automation, robot technology, mechanical engineering, machine tools, printing machines and more. Nachi check the chemical and physical properties of every product to ensure consistently higher quality. Search for what you need by inside diameter, outside diameter or width or filter the range for either single bearings or pairs.